I don’t know when my love of books began, but I do know it hasn’t ended. Hence, I chose the moniker, Book Lover. It is difficult for me to walk past a bookstore without entering to buy a book or two. My book shelves overflow with murder mysteries, romance novels, science fiction stories, historical books, biographies, as well as “how to” books on writing. Imagine my joy at seeing our two year old granddaughter’s delightful reaction to visiting a bookstore for the first time. Each of our subsequent visits to her city included a trip to “her” store. Alas, that bookstore is now closed. Like fellow blogger, John McCarthy, I visit bookstores and libraries whenever I travel. 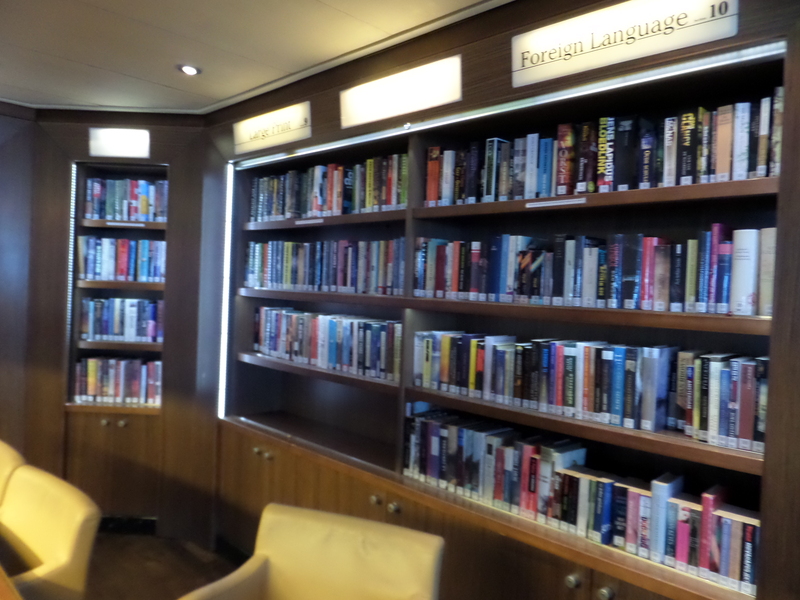 Recently on a Holland America cruise to the Caribbean, I took pictures of the ship’s library which I’ve always visited and taken for granted. There are separate large sections of books for Travel, Best Sellers, Leisure, Large Print books, several game tables including one with chess pieces in place, magazines, 12 to 16 computers, and the librarian distributes a new Sudoku puzzle daily and a daily crossword puzzle or word search. The library amenities can easily satisfy travelers. 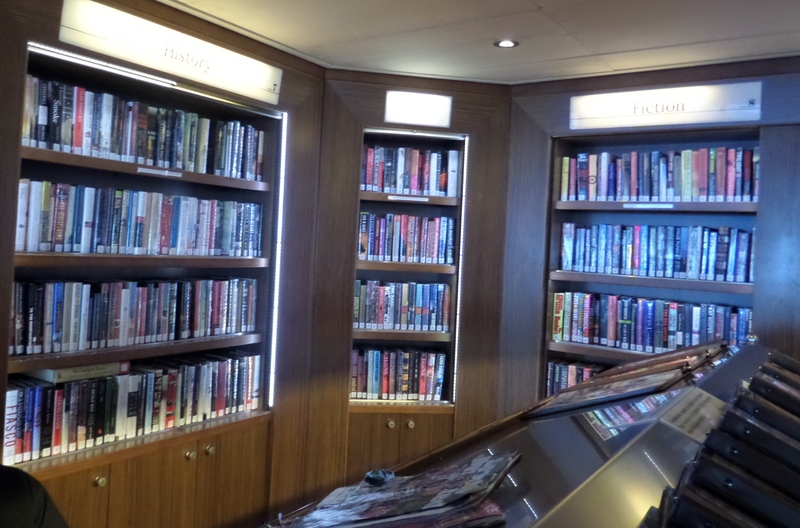 These are a few of the pictures I took at the library on Holland America’s Eurodam cruise ship. Every visit to a bookstore or library now reassures me that we haven’t yet reached the world depicted in Ray Bradbury’s Fahrenheit 451 or Markus Zusak’s The Book Thief where books are burned. Reading is simply magical. I wish there was more time to spend relaxing in a comfy chair and with a book in hand. So do I. I’ve rarely found the time to read an entire novel in one sitting. Or is it the guilt of dust bunnies calling my name, or dinner that must be cooked, or dishes that must be washed that prevents me from relaxing with a good book. I’m envious of your bookstore experiences and am concerned about the sustainability of book store business models. For me, I’ve always nurtured a library following. As a child, my family never bought books but borrowed them from the library. If I ever thought to look for something at the library, I found it, tho sometimes through interlibrary loans. As a child, I looked forward to Mondays at the local library. I was allowed to stay until it’s 8:30 PM closing and always took home several books. As an adult, I enjoy visiting bookstores during my travels whenever I can. Society certainly could not have evolved without the power of books to educate people and stimulate thought and conversation. I agree wholeheartedly. Let us always have books that educate, empower, as well as entertain us. As a book collector, I love reading about your travels. Thanks for sharing.